Look! It's A Tri-Fi Christmas! Look! It’s A Tri-Fi Christmas! Last summer I got together with my TRI-FI bandmates, Keith Hall and Phil Palombi, and we thought, “Wow, this hot weather makes me wish it was Christmas. We should record a Christmas album!” And that’s exactly what we did. So, we set up a Kickstarter Fundraising Drive (check out the goofy video we made) and about 120 amazing people agreed that it was a good idea – they jumped in, pre-ordered the album for themselves and their friends, and the next thing you know we were able to pay for the recording and production process. We had a blast recording the 12 holiday classics and I hope you’ll take a moment to check it out. To put yourself in the holiday mood you can listen to samples right here on my site. 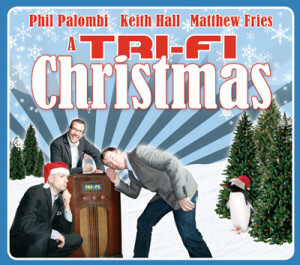 Then you can order it directly off of the TRI-FI website – as a CD or as a high-quality digital download.